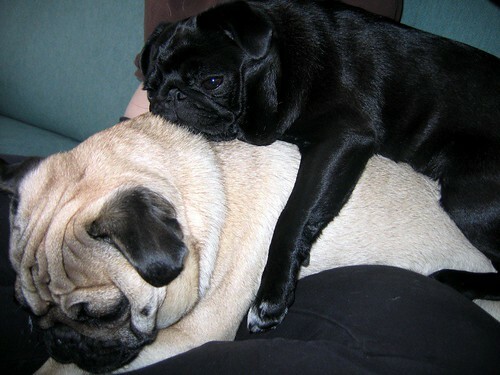 Stackable pugs! | Separated by a common language. Well, I guess today is one of those rough days you have on new medication. I can’t seem to concentrate today. I didn’t want to get up for work, and I keep looking at the clock. Work is GOOD too, so I think it’s just one of those freakout days. I just want to curl up in a warm blanket and sleep. You know, get the pugs all up in the blankets for some good snuggles. I’m sort of jittery, too. I can’t keep it together today. I’m hoping that maybe by next week that I’ve settled into the new medication and that I will function better. I must say that it really helps to go off of one as you’re going onto another. Then at least you’re never not medicated, and I suffered a great deal less when I did a few days of two medications, than trying to go off of one completely, and then start a new one from zero. I’m not in a bad mood or anything, either, I just want to go home and have a sleep. It’s probably because of the massive amount of rainfall happening as well. Sorta cold, sorta dreary, sorta makin’ me not want to do anything weather. In other news, Winston has taken a liking to peeing on a lot of things in the apartment. NOT GOOD! He peed on my trench coat right after I washed it, he’s peeing on my jammies, and he peed on Steve’s hoodie. All in two days! Damnit! I’m not really sure if there’s anything I can do to get him to stop. I mean, I know that it seems to be smells on clothing, so I have that. The weird thing is that he’s peeing on washed AND unwashed items. I guess he’s just trying to get his smell OVER other smells? Sort of like I WIN I WIN FOR SMELLS! WINSTON IS THE BEST! He’s doing it when I am out of the house too, so I can’t just jump up and say, NO!! for now, I’ve had to close the bathroom and bedroom doors, and I’m trying to keep all clothing strewn about to those two rooms. Hopefully that will work. I’m not too sure what else to do! Attach a balloon to the end of Winston’s Old Chap? When it’s full, just change it for another one. Hope you’re feeling more like yourself soon – switching meds is always a rough transition, but you’ll get through it. And if you need a day to snuggle up and just sleep? Then you should. It will do wonders for you. I’m sorry you are feeling poopy. Soon the beautiful flowers will be blooming though and that makes for happy. Sometimes dogs will pee on things that they feel are out of place. You might want to be sure to always hang your clean clothes up and put your dirty clothes in the laundry basket. Sometimes dogs just see something out of place and give it a squirt to say to you – Ha! This does not belong here! Dogs like order. Maybe you are messing with that order in his mind. Hope you’re feeling back to the old Doozy soon. I hate those “off” days when you feel like you’ve suffered an invasion of body snatchers. Has Winston been fixed? He could just be marking his territory. Un-neutered dogs tend to do that.